The Beauchamp Recreation & Wellness Center will offer students, staff and faculty cutting-edge amenities and a central hub for campus activity. For its new campus recreation center, the University of Portland sought a state-of-the-art new building that could be designed and constructed within a strict budget and that would provide the most return on investment. HOK’s design reinforces the message that this building is the new heart of the campus community. The concept creates a “campus beacon” that draws students toward the activity that is taking place within the building. Glazing around all sides of the building connects the indoors and outdoors. At night, the building acts like a two-story beacon of light that filters out to the campus. Fitness “neighborhoods” inside the building maximize space efficiency while making the recreation center feel more approachable and intimate. The center’s 79 percent space utilization rate is significantly higher than the national average of 68-72 percent for campus rec centers. Traditional spaces such as gymnasiums, exercise studios and a suspended track are enhanced with unique amenities including a 32-foot-high climbing wall, an outdoor pursuits center and a functional training area with a covered courtyard that allows for outdoor activity during any weather conditions. Close collaboration between HOK, local architectural partner Soderstrom and the construction manager, Skanska, enabled the team to expand the program while staying under budget. 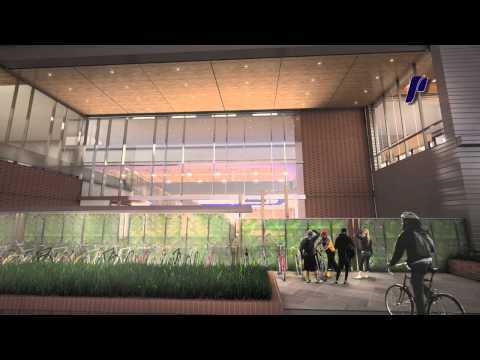 Oregon’s Daily Journal of Commerce shares images of the new University of Portland Beauchamp Recreation and Wellness Center.